I use a timer on a regular basis both for cooking and for various exercise routines. 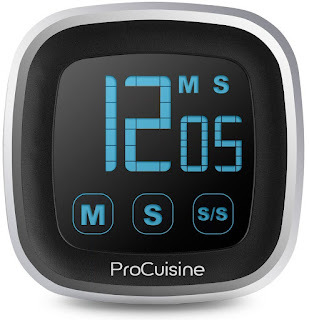 The ProCuisine Touchscreen Digital Kitchen Cooking Timer works great for both purposes. It has a great look, and also provides lots of functionality. I really like the sleek design. It has a very nice appearance, and the LCD touch screen display makes it very easy to read. It can be used with the retractable stand for placing it on a counter or table, or you can attach it to your refrigerator or other metal surface with the magnetic back. This device can act as a stop watch, either with or without an alarm, or you can use it as a digital timer which can count up or down. I have used it both ways, and really like to be able to change the way I measure my time while exercising. It is powered by two AA batteries which are included with your purchase so it is ready to go when you get it. Although I prefer rechargeable devices, the AA batteries are relatively inexpensive and readily available, or if you prefer you can purchase rechargeable AA batteries and charge those instead. I have absolutely no complaints about my new digital timer and am happy to recommend this to anyone who needs a timer or stopwatch for cooking, exercising, or any other purpose.